Remember last year how Conor had strep throat 3 times in just a short period of time? And he had an allergic reaction to Amoxicillin? The other medicine to cure his strep throat costs $108. So the doctors felt he really needed to have his tonsils removed because of all his problems. So, we did that. In September of 09, he had the surgery. Fast forward to March of this year - March 17th to be exact. St. Patrick's day. Conor wasn't feeling well, was running a fever and was miserable. So, we went to the doctor. 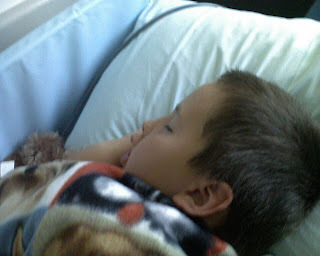 I thought he may have gotten the H1N1 flu again, I never even thought it would be strep. The doctor did a few tests - blood tests, throat culture - only to find that he did have strep throat. What? Really? How is that possible? I am still making payments on the bills from his surgery to prevent him from getting strep throat again! Oh, it happens, she said. It's rare, but not impossible. So, I fill the prescription and he takes it for his 10 days and is doing fine. Sunday when he comes home from my mom's house, he said he doesn't feel well. Sore throat, watery eyes, runny nose. He still wants to play outside, and is relatively active. I take his temperature and it's normal. Monday morning he says he doesn't feel good and doesn't want to go to school. He looks tired, and his eyes are red, so I call my mom to see if she can watch him. He begs to go to work with me, but I refuse because he would be super bored at my office for 8 hours. When I call to check on him he asks me to get him during my lunch hour and bring him back to work with me, and I agree to that. I take a late lunch and he would only be there about an hour and 45 min and I figured I could keep him occupied during that time. I get coloring books, activity books, crayons, and a few other things and take him to my work. He colors for about 20 minutes and then asks if I can take him home. He suffers through the rest of the day - bored - and we finally get to leave. We stop at a pharmacy on the way home to get some allergy medicine to see if that helps him. He seems fine the rest of the night. Tuesday morning, he says he doesn't want to go to school. I tell him I think he's faking it and that he has to go. He cries and begs to stay home with his dad. Conor loves school, and he's never lied about being sick, so I figured maybe he really didn't feel good. He didn't have a temperature though. I told Jeff if he acted like he felt better later he could take him to school. Tuesday night, he begged to have a friend over. We explained once again that he had not gone to school that day, so he could not have anyone over, and that he was absolutely going to school the next day. Wednesday he went to school. 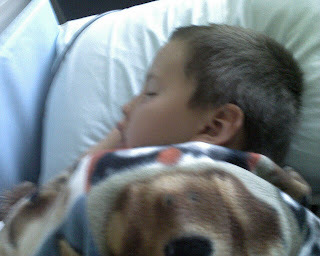 He said he had to go to the nurse because he didn't feel good, but school rules say if you don't have a fever and you aren't throwing up, you can't call home to sign out. Wednesday night, he acted fine again. Thursday morning he cried again, saying he didn't feel good. So I broke down and took him to the doctor. Do you know where I'm going with this? Yep, he has strep throat AGAIN. So, I'm feeling pretty guilty for not doing something about it earlier in the week. His symptoms did not make me even consider it was strep. And boy did he ever rub it in that he was right and I was wrong. Wow, poor kid! Hope he feels better fast. Aww, Poor Conor, I'm so sorry he hasn't been feeling well! It's tough to be sick and bored. I hope he's much better by now. Love you Kiddo! What should I catch up first?